I love the possibility a bunch oflemons presents, like when you decide to splurge and buy the whole bag instead of just one or two. Some people might impulsively spend $7 on a big bag of M&M's, but not me. I get a buyer's high off lemons. It's like holding summer right in your hand... even when it's raining on Memorial Day. What will I make with all those lemons, I'll ask myself? Maybe I'll make some Chicken Curry tonight. Tomorrow I could make Lemon Pudding Cakes or simply a tall pitcher of lemonade. Last weekend I bought a bag of lemons for a baby shower that Ashley and I catered. Best. Shower. Ever. 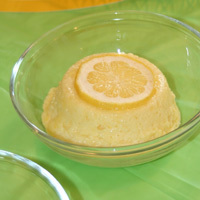 There was tart lemon mixed with a generous dose of sugar in the Lemon Pudding Cakes and Frozen Lemonade. 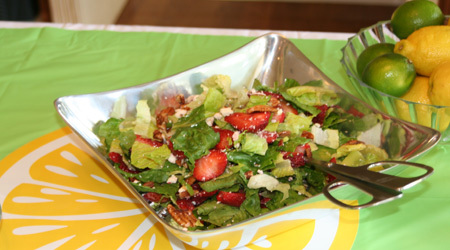 Add in some Chocolate Strawberry Croissants, a fabulous Quiche, and a Very Strawberry Salad to round it all off. I wanted to keep eating forever, but I got full. I hate that! 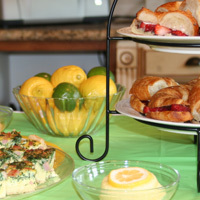 This meal was great for a baby shower but has all the elements for a great brunch of any kind. All the finer points and grocery lists are in our occassions section, along with more pictures of the food, of course! Everything in this meal is great, but I especially recommend the Frozen Lemonade. Maybe I'll make some tonight and make a toast to the missing sunshine. 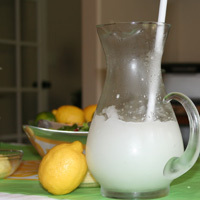 1 Day Before: Frozen Lemonade: Mix the Lemonade base. Refrigerate. 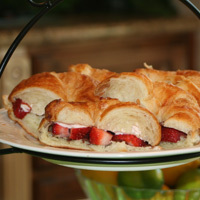 Chocolate Croissant: Make straweberry cream cheese. Refrigerate. Quiche: Make your quiche crust and form it in the pan. Refrigerate. Frozen Lemonade: Make sure your ice-cream bowl is in the freezer for 12 hours. and dry lettuce. Blend the salad dressing and refrigerate.